Compatibility categories will be sorted by number of rear sprockets. It is important to note that there are three major rear freehub standards – a) Shimano standard supported by most other manufacturers (SRAM as the biggest one), b) Campagnolo standard and c) SRAM XD standard that accepts cassettes with the smallest sprocket of only 10 teeth. Campagnolo uses different spline design, so Campagnolo cassettes can only fit Campagnolo freehubs, while Shimano cassettes will only fit Shimano compatible freehubs. Stated compatibilities also go for SRAM (and most other manufacturers’) cassettes with the same numbers of sprockets – they’re compatible with Shimano, except the SRAM XD cassettes. 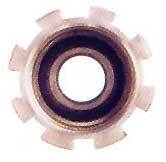 All the current (since the year 1990) freewheel hubs are compatible with all the 6 and 7 speed freewheel sprockets. and freewheel sprockets that are screwed onto it. 7 speed freehubs accept 7 speed cassettes. Cassettes with more sprockets can also be fitted onto 7 speed freehubs, but some sprockets need to be removed. The smallest sprocket must never be removed since it is profiled to accept the lockring holding the cassette in place. When removing sprockets, if it is not the largest one, expect shifting between the two adjacent sprockets left to be a bit sluggish, since sprocket teeth are profiled to allow faster shifting, but removing one sprocket messes up that pattern. 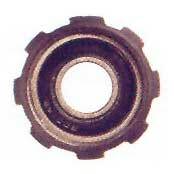 8, 9 and 10 speed cassettes can be used if one sprocket is removed. 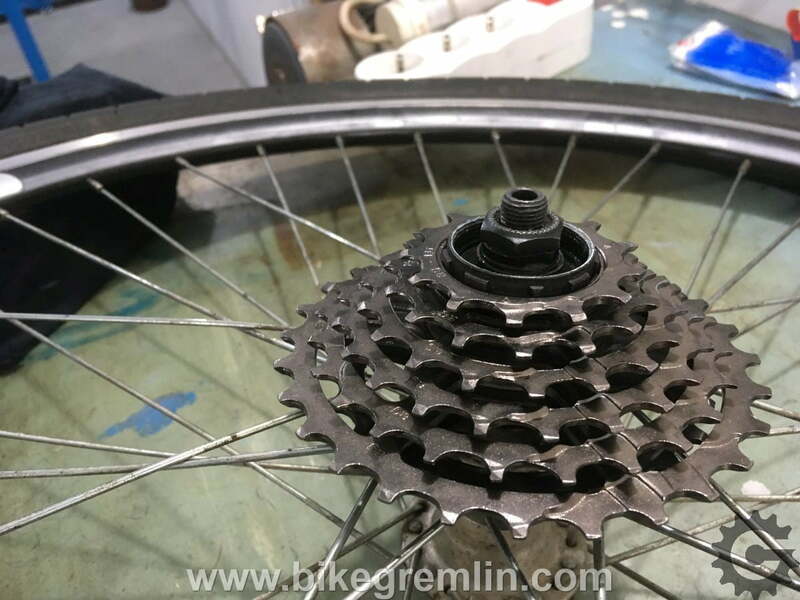 11 speed MTB cassette should also fit with just one sprocket removed, but here, along with the smallest, the biggest sprocket also mustn’t be removed – it is specially designed to take up less space on the freehub body. 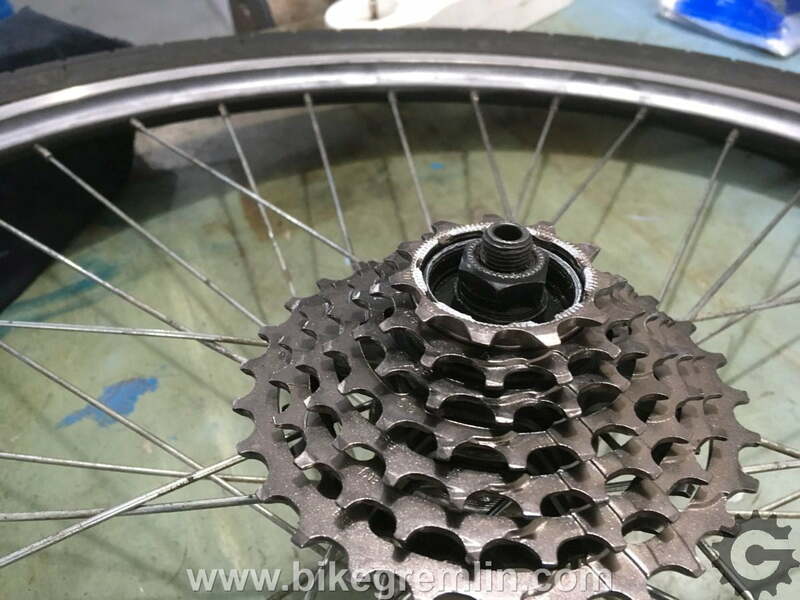 11 speed road cassette – two sprockets need to be removed. Unlike with 11 speed MTB, here the biggest sprocket can be removed. It accepts all the cassettes, except 11 speed road ones. When placing a 7 speed cassette on such freehub, a 4.5 mm spacer needs to be placed before the cassette. 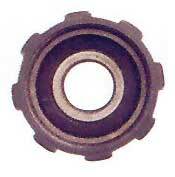 Then check if the smallest sprocket engages the freehub splines. If it doesn’t, check if the largest sprocket has gotten over the spacer correctly (the spacer mustn’t be too “tall”). If this doesn’t help, try using a bit narrower spacer, to make sure the smallest sprocket is slit onto the splines properly. This is important whenever mounting the cassette: smallest sprocket should engage the freehub splines, so it doesn’t turn freely, but it mustn’t be aligned with the freehub body all the way – it should be a bit “taller”. Otherwise lockring won’t be able to lock the cassette in place. If the last sprocket sits too deep, add a (thicker) spacer. If it turns freely, remove a spacer (or one sprocket, if there are no spacers used). 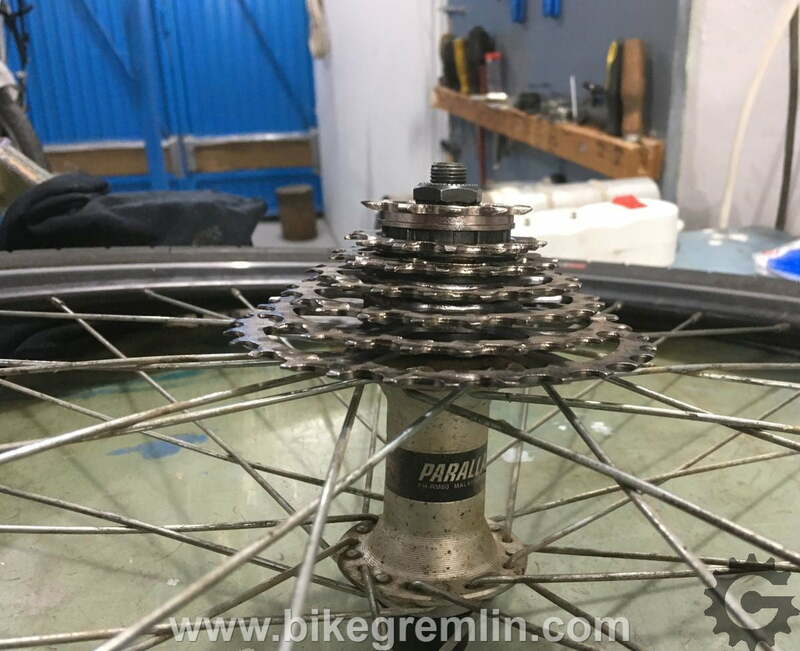 7 speed cassette on an 8 speed freehub without added spacers (or with spacers that are too thin) – the last sprocket can’t reach the rest of the cassette to lock it and hold it in place. An 8 speed cassette spacer (thinner one on the left) and a 7 speed cassette spacer (on the right). One 8 speed cassette sprocket and spacer give optimal height for mounting a 7 speed cassette on this freehub. A 7 speed cassette mounted on an 8 speed freehub with added spacers of optimal width (thickness). There is enough room for the last (locking) sprocket to be placed on the freehub splines. 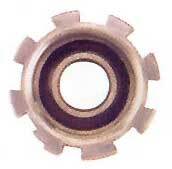 Toothed outer profile of the last sprocket. 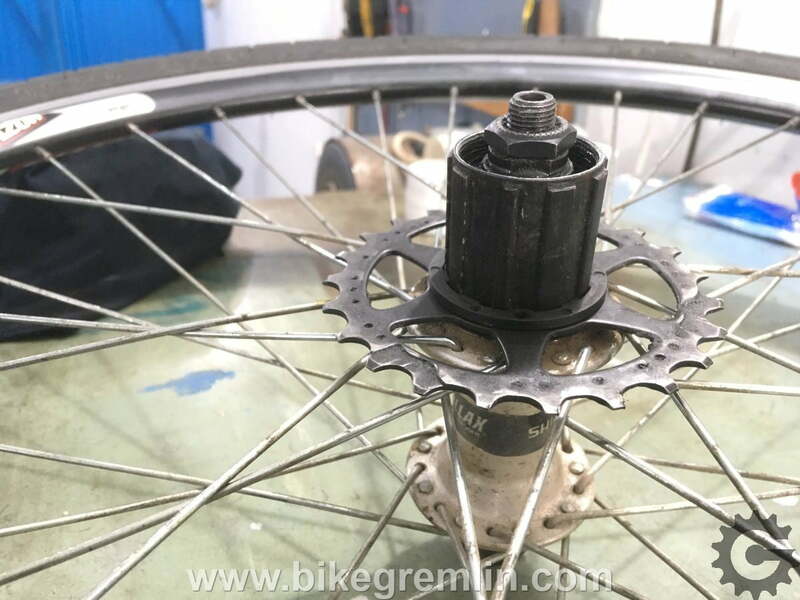 Pictures above don’t show a case when there are too many spacers (or they are too thick) – then the last sprocket would not be able to sit on the freehub splines properly. 8 and 9 speed cassettes are placed directly, without any spacers (9 speed cassette has narrower and more tightly spaced sprockets, so it has the same overall width as an 8 speed cassette). 10 speed cassettes have even narrower, more tightly spaced sprockets, so their overall width is actually smaller than that of 8 and 9 speed cassettes. That is why placing a 10 speed cassette on a 8, 9 and 10 speed freehub requires a 1 mm wide spacer. 11 speed MTB cassette is put straight on, just like 8 and 9 speed ones. 11 speed road cassette doesn’t fit this freehub. One sprocket needs to be removed (not the smallest one because of the lockring). Then a 1 mm spacer needs to be put before the cassette (do check alignment and put a thicker spacer, or remove the spacer if it all fits). Shimano also used to produce special 10 speed only freehubs for a while, which are a few mm narrower than 8 and 9 speed freehubs. Only 10 speed cassettes can fit these freehubs. 10 speed cassettes are mounted onto these freehubs without any additional spacers. There are also 10 speed freehubs with aluminium body. Splines are taller, so that more material comes in contact with (narrower) 10 speed sprockets so they don’t cut into the freehub body under load. 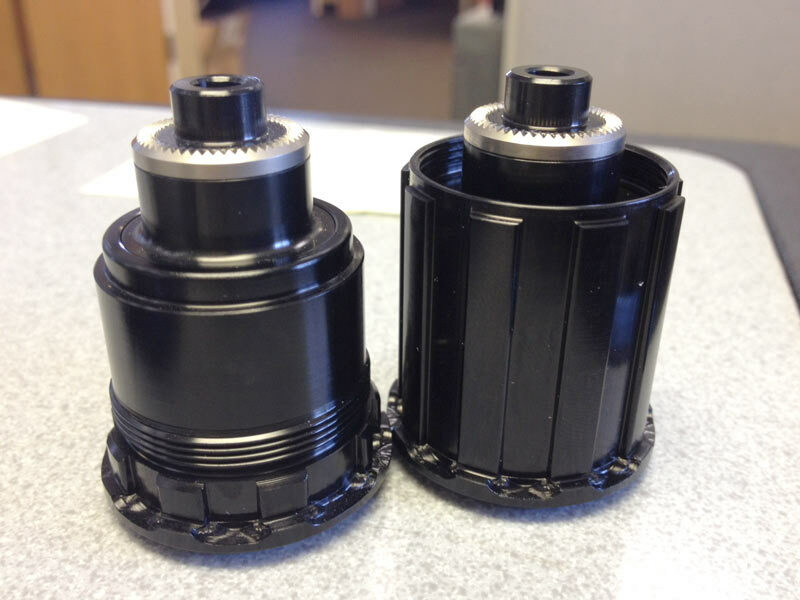 These hubs can not fit 7, 8, or 9 speed cassettes because of taller splines. In practice, when a term “10 speed freehub” is used, it is usually meant the 8 and 9 speed compatible one, not the exotic 10 speed only Shimano stuff! Since MTB 11 speed cassettes can be mounted on the 8, 9 and 10 speed compatible freehub, this one is meant for road 11 speed cassettes only. 8 and 9 speed cassettes can be used with a 1.8 mm wide spacer. 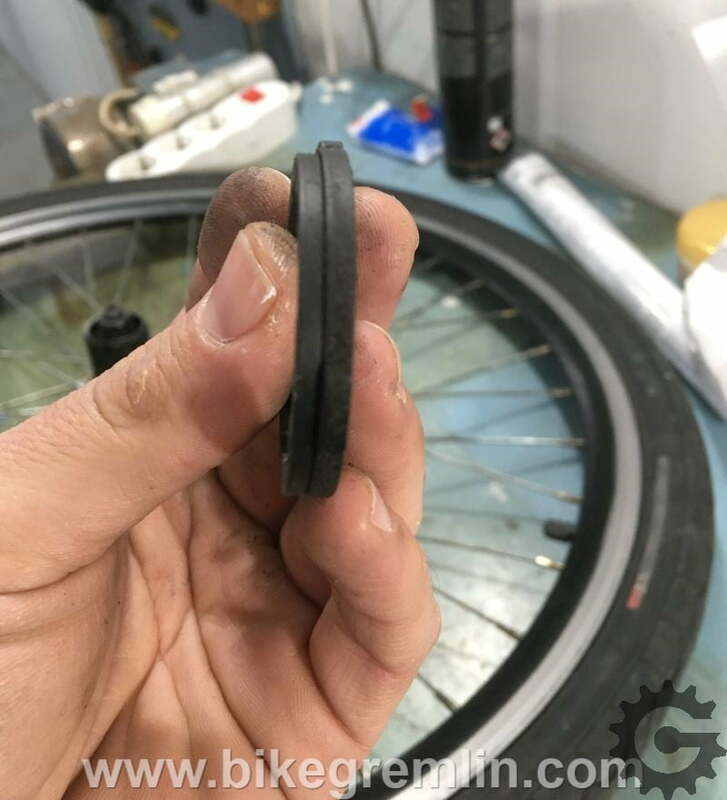 10 speed cassette requires an additional 1 mm wide spacer (along with the 1.8 mm wide one) – just like when putting a 10 speed cassette on a 8-9-10 speed freehub. 7 speed cassette will require 4.5 mm spacer, in addition to a 1.8 mm wide one (used when mounting 8 and 9 speed cassettes). From summer of 2018, new standard, completely different from all the others. Freehub splines and cassettes are mounted differently and can’t be combined with other standards. Shimano 12-speed MTB cassette with the Hyperglide+ mounting interface. Shimano Hyperglide+ freehub with Micro Spline interface. New cassette teeth design is called Hyperglide+, while the new mounting interface is called “Micro Spline“. It has 23 deeper splines, where Hyperglide has 13. Detailed explanation is at the following links: Hyperglide+ freehub and Hyperglide+ cassette. 7 speed freehub is about 5 mm narrower, but all the old 7 and 8 speed cassettes will fit both 7 and 8 speed freehubs. Current Campagnolo 8 speed standard. There is also a discontinued 8 speed standard for titanium cassettes, that are no longer produced. Old Campagnolo 7 and 8 speed standard. Current, Exa-Drive 8 speed standard. Ridge at 12 o’clock is wider, to ensure proper sprocket orientation when mounting them onto the freehub. Obsolete Campagnolo standard for 8 speed titanium Exa-Drive cassettes. Ridges are wider at 5 and 7 o’clock, to ensure proper sprocket orientation when mounting. Standard for old, Exa-Drive 9 speed cassettes. Old 9 speed Campagnolo Exa-Drive standard. Wide ridge at 5 o’clock and a stepped ridge at 7 o’clock. Current Campagnolo standard – suitable for all the modern Ultra-Drive cassettes, whether they are 9, 10, or 11 speed. Cassette carrier (freehub) has been redesigned and accepts cassettes with the smallest sprocket of only 10 teeth! Right: Shimano hyperglide compatible freehub. XD freehub standard accepts only XD cassettes. There are 10, 11 and 12 speed versions. Many wheel and hub manufacturers make XD compatible freehub bodies that can be screwed onto the hub instead of the old Shimano compatible freehub. Unfortunately, as far as I know, Shimano is not among them for now. As of mid-2018, SRAM has introduced NX Eagle groupset, that includes 12 speed cassettes compatible with Shimano (and SRAM) standard freehubs (for 8, 9, or 10 speed cassettes). However, they don’t allow for the smallest sprocket to be smaller than 11 teeth. Thanks for the great info, it actually is useful. So is the 11speed road cassette 1.8mm wider then a 10speed MTB cassette? Yes. 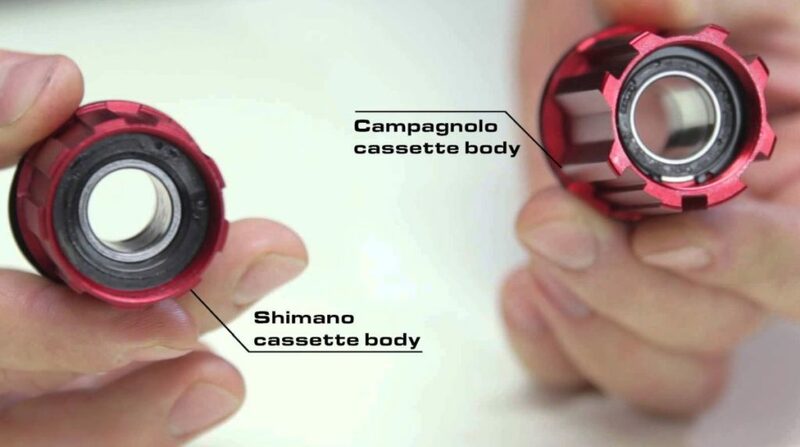 A Shimano 11 speed road cassette is about 1.8 mm wider than a 10 speed cassette. Just to note that for 10 speed cassettes – there’s no difference between road and MTB ones: same width, pitch and sprocket thickness. I have formula hub 142×12 with non anti bite guard freehub feature. Now I want to replace it with different manufacturer Freehub Body but same measurement 142×12. Is it compatible? That would depend on the profile of the freehub part that gets onto the hub. These things differ from model to model for all I know. So do check, compare, but it’s not just the axle and width, but also the number of ratchets and the shape of the part going towards the hub. Not sure if I’ve explained properly, let me know if You need pictures and more clarification. Thanks relja for the help.